Hey everyone. I've got more Christmas nail art for you today. Lately I've been feeling uninspired to do my nails. I've got quite a bit going on in my life at the moment so it's been busy and I haven't felt like sitting down to do my nails even though at one point it was the thing that helped me relax. I hope to get back into the swing of things soon but we'll see, right? Anyway, in the meantime, don't worry, I still have nail art to show you. 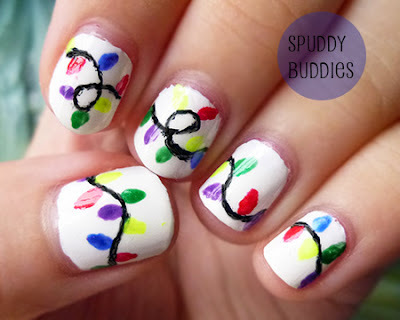 Today's design is one that has been on my nail art wishlist - a string of Christmas lights! I LOVE seeing Christmas lights - it gives everything a magical look and reminds me of Disneyland during the holiday season. Hmm... how I got white polish onto my skin is a good question... Haha, let's just say I really lacked control when I was painting them. 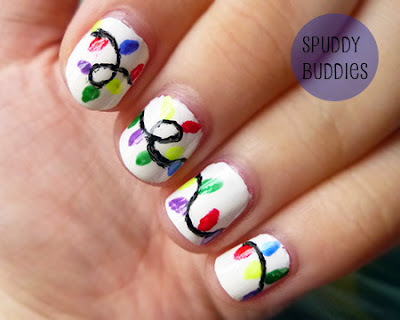 I used a black nail art pen to draw the wire first then I blobbed on the lights using a nail art brush. This design, as with the most of the other designs I've done, was really easy and I believe anyone can do it too. 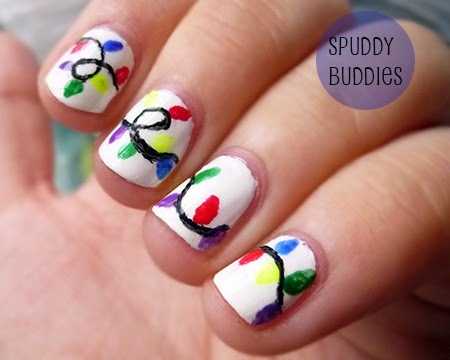 If you're looking for a cute Christmas design to wear this holiday season, I hope you'll give this a try. I love when I find easy designs that turn out well. That's the fun in nail art for me - simple but beautiful creations that anyone else can do. What do you think of Christmas lights? Are they a must-have in your house for Christmas? What kind of Christmas lights do you hang? 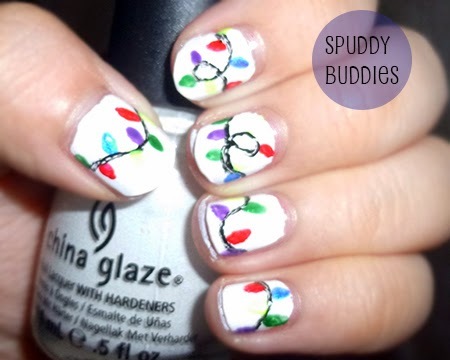 Ever tried Christmas lights nail art? I'd love to see them!